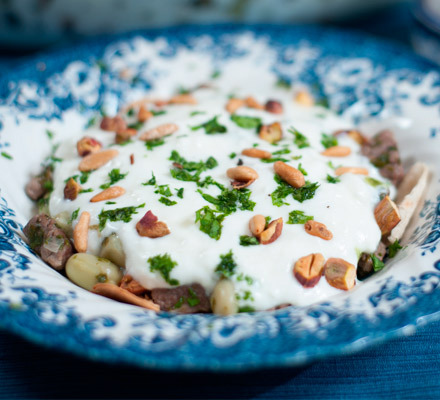 Jordanian recipe from Dima Sharif, a cooking instructor, food artisan and author of the Dima’s Kitchen food blog. Place the thawed and washed green broad beans in a cooking pot. Top with chicken or beef broth, season with black pepper and salt if needed (only if broth is not seasoned), and sprinkle with a dash of olive oil. Bring the mixture to a gentle boil over medium heat. Sauté the finely chopped onion in 1 tbsp olive oil till translucent but not browned. Add meat and stir to mix. Season with salt and pepper and cook, stirring occasionally until the meat is browned and liquids run out. While the meat is cooking, in a separate skillet, sauté the sliced garlic and coriander for about 5 minutes, or until wilted. Add the coriander mixture to the meat mixture and stir to mix. Ladle some of the broth from the cooking broad beans into the meat mixture and stir to coat. Bring to a boil, and remove from heat. Combine the meat mixture with the broad beans mixture together with the liquids and bring to a gentle simmer. Deep fry or toast the bread squares, till golden, drain on paper towels. Prepare the yoghurt sauce by mixing all the ingredients together. To assemble, place the bread squares along the bottom of a large serving dish (traditionally a see through glass dish). Top with the broad beans and meat mixture. Spread evenly. Top everything with the prepared yoghurt sauce and spread to cover the whole surface. Sprinkle the tops with the nuts and chopped parsley. Serve.